Chances are that, if you’re reading this, you have above average computer skills. You may not realize it, but you’re probably pretty tech-savvy! It turns out that what we might consider to be “basic computer skills” are actually pretty advanced, when compared to the average global population. 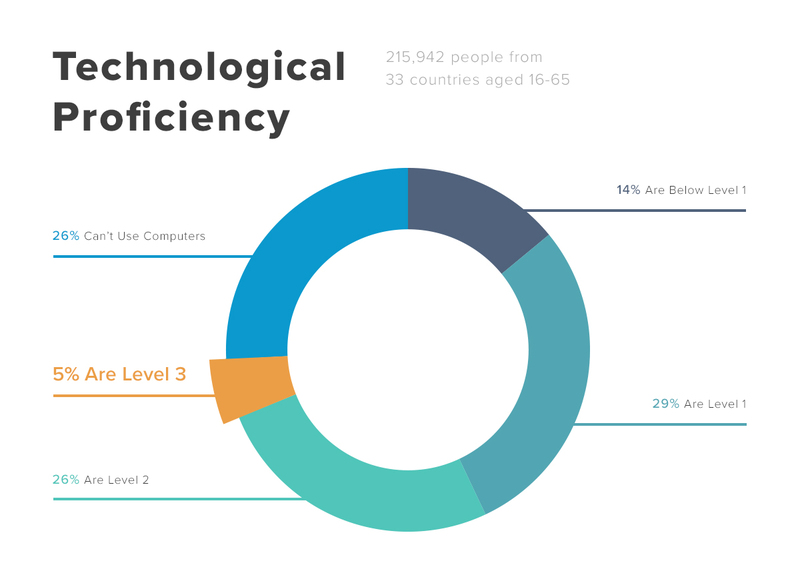 In 2016, the OECD (Organisation for Economic Co-operation and Development) conducted a study to discover the distribution of users’ computer skills, and it turns out that it’s worse than you’d think! This was especially surprising to us! That’s more than a quarter of the surveyed adult population being unable to use computers at all. It goes to show that, even in the “digital age”, there is still a distinct divide in computer literacy and skills. At this level, the OECD says that at this level, “[t]asks are based on well-defined problems involving the use of only one function within a generic interface to meet one explicit criterion without any categorical or inferential reasoning, or transforming of information. Few steps are required and no sub-goal has to be generated.” An example of the type of simple task that could be completed by someone at this level would be to delete a message in an email app. Based on this information, the average person would likely be operating at around a Level 1. And we can bet that you are significantly above average, probably with a technological proficiency at about a “level 3”. Nice work! Well, no, not necessarily. It’s pretty safe to assume that those using your website will have have a lower skill level than you. However, that doesn’t mean that they are “average” – what’s considered an average skill level is actually quite low. By designing for everyone, you appeal to no one. Alright, we’ll go right out and say it: your target audience isn’t “everyone”! It might seem like a good idea to make your product or service appeal to anybody and everybody. However, it’s just not feasible. Frankly, there’s no way any business can afford to target everyone – there are 7.442 billion people in the world! You are not solving the problems or meeting the expectations of your potential clients. In our experience, your potential clients are looking for something regarding your product or service that resonates with them. A generic design means they won’t find anything that stands out, and they’ll pass you by. If your website doesn’t meet their expectations, how can they depend on you to meet their expectations with your product or service? Now we’re at the key question! And that answer is: your target audience. It’s important to really consider who your client base is – not only right now, but in the future! Good web design comes from knowing your target audience. Period. Really, nearly every decision made in the web design process circles back to this fact. Of course, there are so many other factors that come into play, and your satisfaction is crucial, but ultimately, we do it all for the user. That’s why the research phase is one of the most integral pieces of Our Approach. Once we know who will be using your website, we can then go about creating a tailored user experience based on the needs and skills of that audience! Want to know more about how to define your target audience? We’ll be digging more into this concept in a future blog post – stay tuned!